Civil War Historian Dave Decker presents the life and career of Gen. George Thomas, with special emphasis on his unbroken string of victories throughout the Civil War. The le cture is scheduled for Monday, Oct. 17 at 6 p.m. in Taylor Community’s Woodside Building and is free and open to the public. Thomas is well known as the best commander on defense in the war. 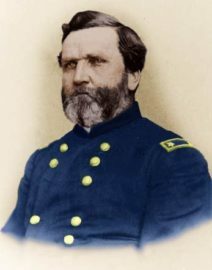 He twice saved the union army from destruction at Stone’s River and Chickamauga. After the second battle, the newspapers dubbed him “the Rock of Chickamauga,” and President Lincoln called his efforts the most heroic act in the history of the world. Decker has been a resident of the Lakes Region since 1963. He’s a graduate of the University of New Hampshire, majoring in Government, and Boston College Law School.